NOAA survey ships and the U.S. Coast Guard Cutter Healy are coordinating transits to and from the Arctic, to collect depth measurements along the proposed shipping corridor. As commercial shipping traffic increases in the Arctic, NOAA is taking major steps to update nautical charts in the region. NOAA’s Office of Coast Survey will use data collected by two of its own ships, Rainier and Fairweather, as well as the U.S. Coast Guard cutter Healy and a private sector hydrographic contractor to cover nearly 12,000 nautical miles in the Arctic for use in updating its navigational charts. The NOAA-led Arctic marine corridor project will work with the Coast Guard to asses the safety of a potential Arctic shipping route from Unimak Island, the largest of the Aleutian Islands, through the Bering Strait to the Chukchi Sea, as proposed in the USCG Port Access Route Study for the region. The Coast Guard will continue to take public comments prior to making a final decision on the proposed route. “Much of our charting data in this corridor is from surveys conducted a hundred years ago,” said Rear Admiral Gerd Glang, director of NOAA’s Office of Coast Survey. Over the past several years, Healy has been collecting multibeam echo sounder depth data while travelling to and from its Arctic research projects. NOAA has reviewed the data, archived at NOAA’s National Geophysical Data Center, and has found they are reliable and can support nautical charting. Last year, Healy worked with Coast Survey to take depth measurements as “tracklines”-- straight paths of transit -- while at sea. The survey is basing its new work on Healy’s 2014 trackline, along with data collected from 16 transits by the three ships and contractor vessel in 2015, using multibeam sonar. The ships will survey depths in lines that are about a thousand meters apart and a thousand meters wide, as they travel back and forth to major project areas around the Bering Strait and the Arctic. Altogether, the ships will collect about 12,000 nautical miles of data along the four nautical mile wide corridor. In addition to measuring depths, they will search for seamounts and other underwater dangers to navigation. 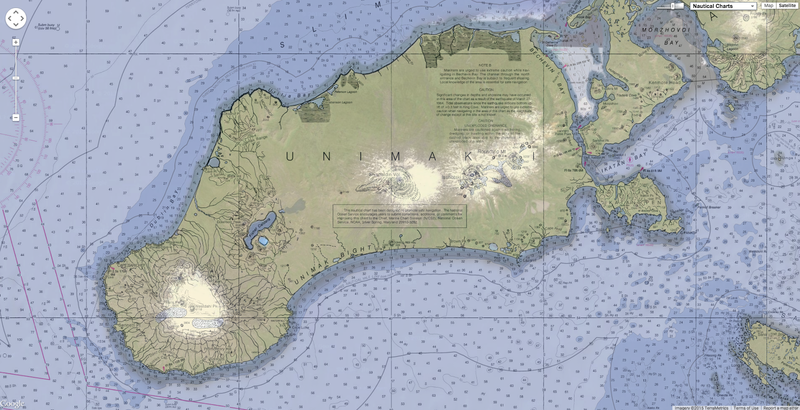 Although Healy’s primary mission is not hydrography, Coast Survey can use Healy’s data to identify significant differences from current nautical charts, and prioritize future NOAA hydrographic surveying efforts. Other work planned for this summer includes joint hydrographic surveys by Rainier and Fairweather in the largely uncharted areas of Kotzebue Sound. In addition, Rainier will survey off Point Hope, Alaska, to evaluate a potential shoal area discovered by NOAA cartographers and researchers using commercial satellite imagery. Fairweather is scheduled to survey Port Clarence, a key Bering Strait location that is of potential interest as an Arctic deepwater port. NOAA ships Fairweather and Rainier are part of the NOAA fleet of research ships operated, managed, and maintained by NOAA’s Office of Marine and Aviation Operations, which includes commissioned officers of the NOAA Corps, one of the seven uniformed services of the United States, and civilian wage mariners.